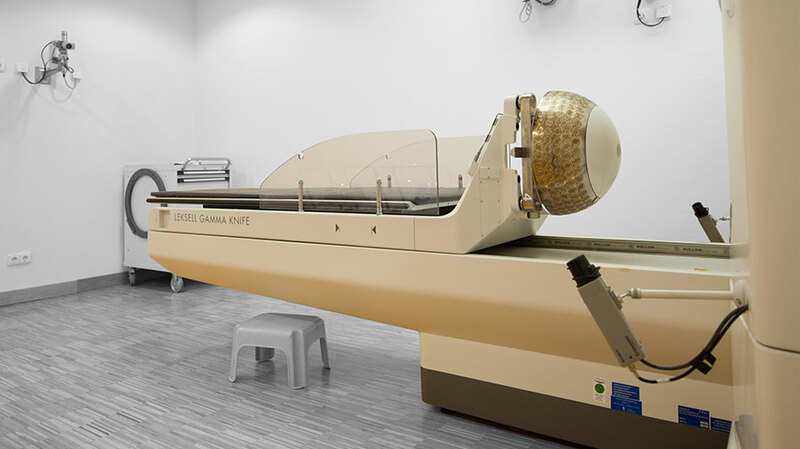 GammaKnife is a high-precision radiation device with 201 radiation sources which are all accurately aligned to one point. Comparable to a magnifying glass, at this point a therapeutically effective, almost spherical radiation field is emerging. The accuracy of the irradiation is ensured by means of a so-called stereotactic frame with a high-precision coordinate system. This type of radiation concentration makes it possible to irradiate the tumor tissue without damaging any surrounding tissue. This unique treatment method proves particularly useful for the radiosurgical treatment of various brain diseases. The implementation of the radiosurgical therapy in accordance with internationally established standards of treatment has been applied worldwide for more than 40 years. To date, over half a million patients have been successfully treated this way. It is an outpatient therapy with no surgical intervention required, most often carried out in just one day. You can then directly return into your normal daily life. An individually optimized treatment planning and the established sub-millimetre accuracy in the target localization guarantee a maximum effectiveness in the fight against tumors and functional disorders with a minimal risk of side effects.